In the summer and fall of 1957, Louis Armstrong, already one of the most important musicians of the 20th century, had one of the most prolific periods of his spirited career. In addition to recording the follow-ups to his highly successful duets album with Ella Fitzgerald, Ella And Louis Again and Porgy and Bess. Armstrong recorded three albums for Norman Granz’s newly minted Verve Records. Across a handful of incredibly productive sessions. For the first time, these records – I’ve Got The World On A String, Louis Under The Stars. Both recorded with the Russ Garcia Orchestra, and Louis Armstrong Meets Oscar Peterson. Plus the previous digital-only release A Day With Satchmo. Have been collected together as Pops Is Tops: The Verve Studio Albums. A new four CD and digital box set from Verve/UMe . Available on April 13. With Granz supplying the cream of the crop of the Great American Song Book and first-class backing. 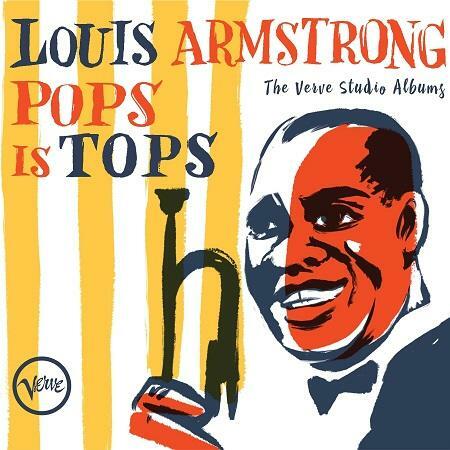 Armstrong’s Verve recordings constitute the definitive portrait of the artistry of his singing. They are presented in their original mono masters. The first time since the original vinyl releases – and include the original liner notes. As well as extensive liners, recording and track info by foremost Armstrong authority Ricky Riccardi, Director of Research Collections for the Louis Armstrong House Museum. Author of “What A Wonderful World: The Magic of Louis Armstrong’s Later Years.” Each disc also contains a wealth of bonus material. Featuring alternate takes from the sessions. Armstrong’s classic duets with Ella Fitzgerald. Will also be released as a new four CD and digital set titled Cheek To Cheek: The Complete Duet Recordings. The 75-track collection gathers their three timeless Verve albums . Newly remastered versions of Ella and Louis, Ella and Louis Again and Porgy and Bess . Along with all of their Decca singles, live recordings from Jazz at the Hollywood Bowl. Recorded as a warmup for Ella and Louis. Plus several alternates and false starts from the Decca and Verve eras. Iilluminating their craft and good humor.